Spring is officially here. It is time to clean out the closet, garage, toy room, attic or whatever appears to be overflowing in your house. Some tackle this project every year, some are on the five-year plan, while others go in about every three months and eliminate a few things. 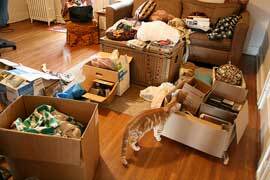 If you are like me, you just move every year and that solves the clutter problem! Regardless of what your de-cluttering strategy is, one thing is for sure, there is something refreshing about making that goodwill drop-off. It is something that no one can do for you because 1) you would not get the same feeling of accomplishment and 2) they may give away those favorite pair of sweatpants from high school that you are just not ready to part with. Is there a relationship between spring-cleaning habits and attempts to make dietary/lifestyle changes? I think so. Is one habit or strategy better than the other? Not necessarily. What is important is to identify what your habits are and identify the most realistic path to get to your goals. Every couple months do you throw a little away? You may prefer to remove or reduce one thing at a time; slowly make dietary changes, such as that daily latte. There is something to be said for gradual consistency. However, this constant cleaning out may be masking an overwhelming sense of fear, or a way to skirt around what really needs to be done. If you feel like you are constantly attempting small dietary changes but are not reaching your goals, you might be better off making one big change. Are you actually eliminating the stuff that is taking up the most space? Do you constantly sort through the small unassuming pile of t-shirts instead of tackling the massive amounts of shoes you trip over every morning? Many people give up or get rid of the things that are easiest to part with. For example, it might be easier to part with the occasional ice cream indulgence, but eliminating the nightly glass of wine may have more impact. Do you get rid of stuff only to replace it with something new or similar? Do you opt for the once a year spring-cleaning swoop? You go for it. Get rid of all the clutter and see the difference right away. You are probably willing to make big dietary changes with the hope that you will see the results in a short amount of time. Many start a challenge, such as the FIT 30-day challenge, with the mindset, “it’s only 30 days.” Make sure you have a plan for after the 30 days. Watch out for over indulges and the vicious yo-yo cycle; we all know yo-yo dieting does not work. If you have never made drastic changes, try it at least once. It is one of the best ways to identify your true dietary needs. But if you are constantly in an purge and binge cycle, it’s time for a little moderation. Do you choose a strategy or habit that you prefer or the one that you know is truly best for you? It is not always about breaking habits; it’s about identifying your habits, and, yes, probably changing or removing some old ones. But, it’s also about understanding how to work with your behaviors in order to reach your desired goals. It’s about identifying barriers, such as stress, travel, or busy schedules, and knowing how to make changes that work with your lifestyle. Whether or not you embarked on FIT’s 30-day challenge, take time to identify your eating habits. At FIT, we can help you identify a path, make suggestions, and provide support, but we can’t clean out your closet for you. You have to do the work and the results will be due to your own actions. This entry was posted in Healthy Lifestyle, Inspiration, Nutrition.